PANMUNJOM, North Korea (AP) — Lt. Col. Hwang Myong Jin has been a guide on the northern side of the Demilitarized Zone that divides the two Koreas for five years. He says it’s gotten quieter here since the summits between North Korean leader Kim Jong Un and the presidents of South Korea and the United States, in perhaps the last place on Earth where the Cold War still burns hot. “A lot of things have changed. Listen to how quiet it is,” he said as he stood on the balcony of a large building overlooking the blue and white barracks and concrete demarcation line that mark the boundary between North and South. A group of ethnic Korean high school students from Japan filed out of their tour bus as North Korean People’s Army soldiers watched disinterestedly with automatic rifles slung over their shoulders. Inside the souvenir shop, still more tourists, from Europe, looked over hand-painted propaganda posters. American tourists are still banned from visiting North Korea under an order issued last year by President Donald Trump that restricts all non-essential travel. While world attention tends to focus on the North’s development of nuclear weapons, North Korea has for decades stationed most of its conventional fire near its border with the South. South Korea’s capital, Seoul, is only about 80 kilometers (50 miles) away from the DMZ and would be vulnerable to heavy artillery, and possibly chemical shells. Such an attack could cause hundreds of thousands of casualties. 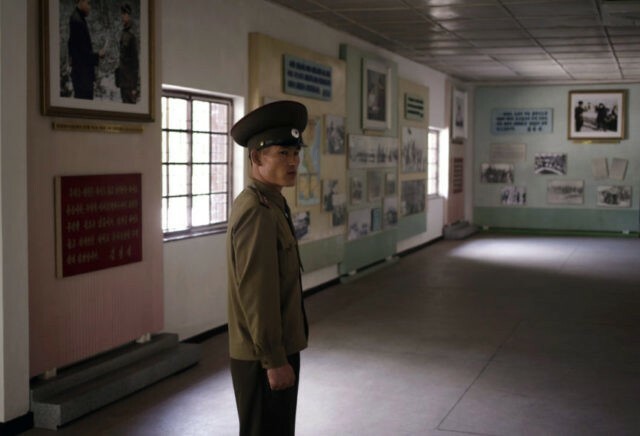 Hwang generally follows a strongly patriotic and unapologetic script as he shows visitors around the usual spots — the building where the armistice that ended the 1950-53 Korean War was signed, a giant stone engraved with North Korean founder Kim Il Sung’s last words, various other spots where talks took place. He still stays strongly on message — his job is to get the North’s position across to the tourists, even if they aren’t especially interested in listening. But he also pointed out a tree planted by Kim Jong Un and South Korean President Moon Jae-in when they held their first summit here in April, and the pavilion where Kim hosted Moon when he came to the North’s side last month. And when speaking to an American journalist, Hwang also seemed a tad less belligerent — or perhaps just a bit more relaxed — on Wednesday. Talmadge is the AP’s Pyongyang bureau chief. Follow him on Instagram and Twitter: @EricTalmadge.